This site is about amateur radio – popularly known as “ham radio”. In particular, it is the online home of amateur radio station ZL1NZ in Auckland, New Zealand. ZL1NZ is a little different from most ham stations, in that it operates entirely with classic equipment from the 1940s to the 1970s. That means lots of valves (“tubes”) which help to keep the radio shack warm through the winter. At the fabulous Hammond Museum of Radio in Guelph, Ontario in 2011. My name is Neil Sanderson. 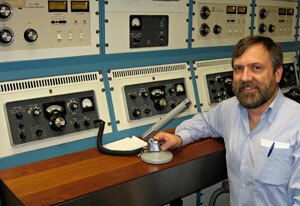 I have been a licensed amateur radio operator since 1970, and still enjoy the hobby tremendously. If you would like to know more about my station, or about how you can get involved in ham radio, please feel free to contact me.